Regardless, I would've gone there sooner or later, probably around the time I'd update my photo and video collection of Kennedy Space Center and Busch Gardens, Tampa. And like KSC and BGT, Seaworld is a day trip. Seaworld Orlando actually fed on the opening of Disneyworld, and opened it's gates in 1973, with much more foresight than Universal. However, unlike Disney, Seaworld has had it's share of owners. The park first opened under the ownership of four individuals, and was subsequently sold to Harcourt Brace Jovanovich in 1986 (see my Marineland of the Pacific page) and sold again to Anheuser-Busch in 1989. In 2008, Anheuser-Busch was aquired by InBev, and the SeaWorld Parks and Entertainment division went along with the beer. InBev, a Brazilian-Belgian brewer started looking for a new owner for the parks. In 2009 the Blackstone Group, who also owns Legoland and Cypress Gardens, (which is being turned into a Legoland) bought the Seaworld and Busch Gardens Parks. The two "theme" parks (Seaworld and Discovery Cove) and water park (Aquatica), all involve animal interaction. But they don't give out free beer anymore. Bummer. 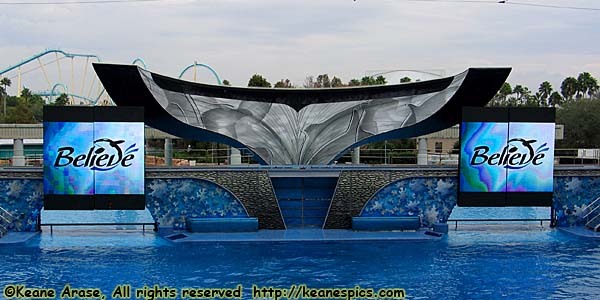 Seaworld was really only an animal behavior park until around 2000, when they opened Kraken, a world-class floorless coaster, and Journey to Atlantis, a dark-ride water coaster. They, like Disney, figured out that thrill rides are a draw. I'm not into coasters, but I'd have liked to of ridden Journey to Atlantis. Too bad it was cooold the day I was there. Water rides just weren't appealing. The park itself is difficult to navigate, since there doesn't seem to be a rhyme or reason to the attraction locations. Perhaps because the park's been expanded a number of times, and perhaps because there's no central location in the park. 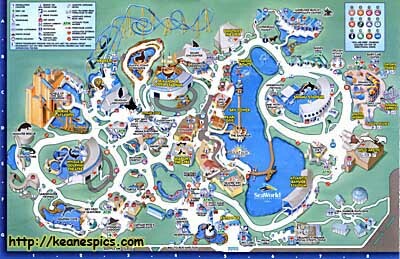 Animals are grouped, so the sea lions are in one place, the dolphins are in another, the sharks are here, and Shamu is there, it's just you won't be able to find here or there without a map. But the park is really about the sea animals, and their behaviors. But the Budweiser Donkey is there. That made it all worthwhile. The only reason I don't have more pictures, is I took mostly video. Animals, generally are better done in video, and Seaworld is no exception. Perhaps one day, I'll export a bunch of video stills.